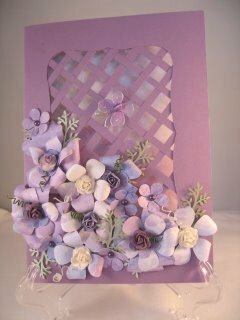 This Trellis Card Tutorial will show you how to it for the "WOW" factor. This beautiful card is one that always pleases me whenever I make it, or see it made by some one else. It looks so intricate and always gets comments and yet it is very easy to do and this short video will show you how. Make it from the colour card of your choice and add any of the embellishments in your stash to make it your unique creation. This surely is a card that you would be proud to give for any special occasion. Imagine how it would be recieved as a wedding card. and if you make them first they can be drying while you make the rest of the card. Mothers Day is on the horizon and what could be more special than this card. "Handmade by.....your name" to the back and then send it with love.